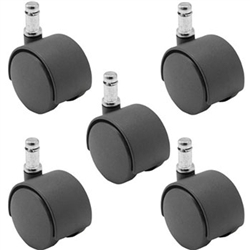 BuyCasters 5 pack of Nylon Twin Wheels Office Chair Casters, with Urethane tread to protect flooring and a Friction / Grip Ring mount, (7/16" Diameter X 7/8"). Flat Black with nylon hood. 75lb Capacity each. OEM replacement option for Furniture and Chair Casters. Most office chairs use five casters and wheels, save money by buying this package deal. The urethane tread offers a cushioned and protective coating on the wheel to help reduce scratching of floors. There are other low quality casters out there for a cheaper price but do not hold up like our, we offer a higher quality nylon and a steel axle for durability. *Perfect replacement caster for your office chair, to help protect hardwood and finished flooring, also works well on tile. Overall Ride Height : 2-1/2"